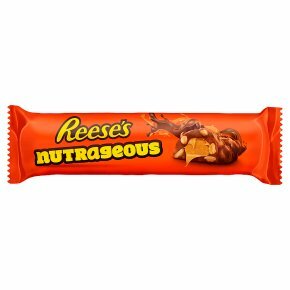 REESE'S Nut Bar starts with a core of smooth peanut butter covered with crunchy peanuts, chewy caramel and enrobed in creamy chocolate flavoured coating. The original Reese's Peanut Butter Cup was created in 1928 as a partnership between H.B. Reese and Milton Hershey. Since then, the Reese's family has grown to include a variety of flavours and forms. Today, you can try Reese's products in dark chocolate, white chocolate, snack-sized pieces and candy bars.